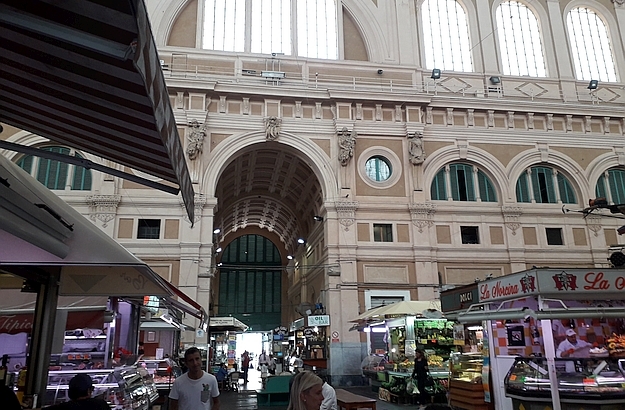 The people from Livorno nickname their beautiful market “our Louvre”. It is one of Italy’s largest and liveliest covered markets. The variety of produce that can be found there makes your head spin. Presented in Giulia’s cookbook: the recipe for the Carbonara di Arselle. At Livorno’s market, fishmongers are gathered in a separate hall. 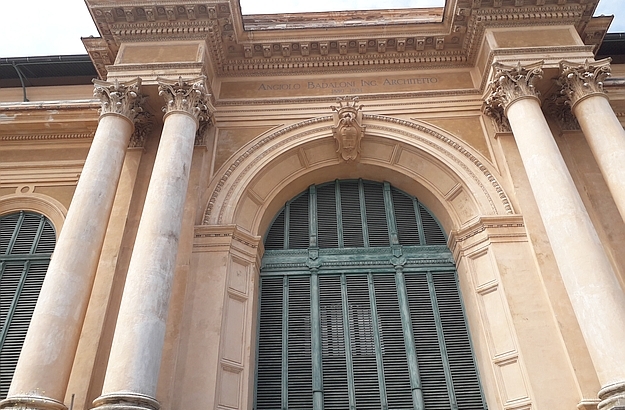 Part of the market’s façade, with the architect’s name engraved at the top. Known throughout Tuscany for their acute sense of humour, the people from Livorno friskily call their superlative market Il nostro Louvre, “our Louvre”. 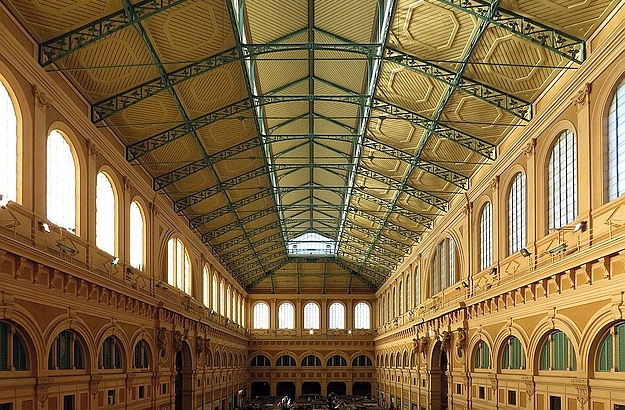 Erected in the 19th century by an architect inspired by French art styles, the monumental hall of the market has, indeed, the expanse and grandeur of a majestic museum. 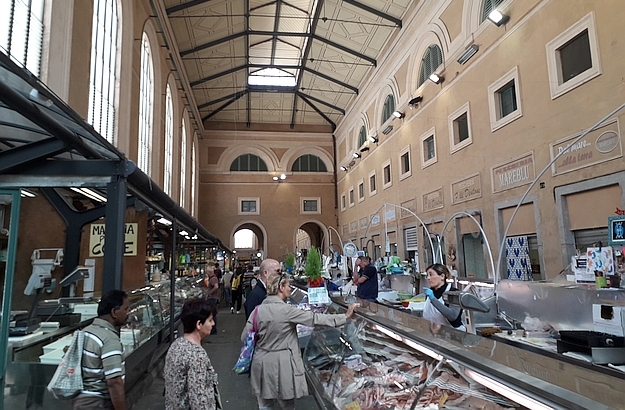 But aside from its size, Livorno’s Mercato Centrale is also blessed with other outstanding peculiarities, one of which is the canal that runs from the nearby sea waters up to the gates of the market hall, allowing fishermen to quickly deliver their daily catch. All the ingredients that make up Livorno’s famous fish soup, the cacciucco – which I’m fond of, by the way, – are sold in the stalls of the fishmongers’ hall, along with the inevitable anchovies, found in so many of the city’s culinary staples. 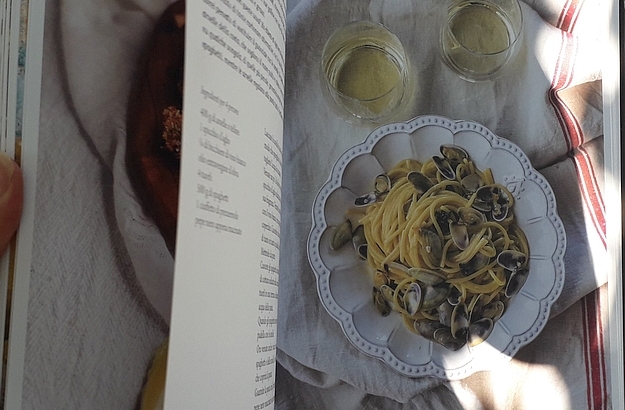 One more word about Giulia’s cookbook, in which you’ll find a meticulously researched compendium of the best food markets in Tuscany, as well as a large number of local recipes making use of the fresh ingredients found at those markets. 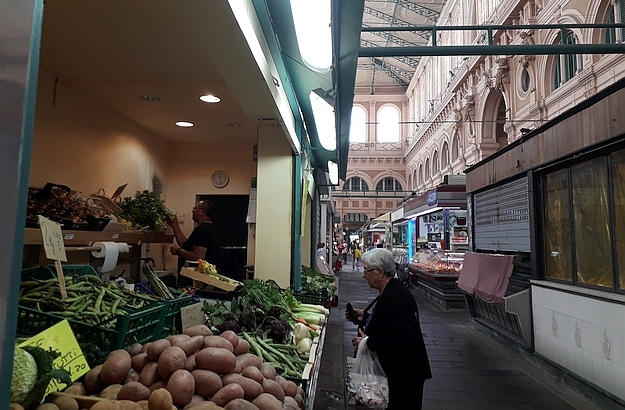 Livorno’s market, the official name of which is Mercato delle Vettovaglie, is located downtown on Via Buontalenti, and is open every day of the week, except Sundays, from 7 am to 3 pm. It is also open from 7 pm to 11 pm on Fridays and Saturdays, from spring to autumn. And don’t forget, while you’re in Livorno, to give the delicious cacciucco a try!